The 16th Annual Salesforce Conference, September 25-28 in San Francisco, was once again the world's largest meeting dedicated to customer relationship: 171,000 enrollees from 83 countries and more than 10 Millions of online viewers were able to enjoy these four days of innovation, inspiration, exchange and Whaou! In 16 years of Dreamforce, assistance (customers and partners) has grown from a thousand people in the first year, to 171,000 people today. From the entrance you can feel the inspiration of the American parks: bird sounds, a false waterfall, grass carpets, giant mascots or rangers to guide visitors.
" We will reap $ 200 million to get every homeless out of the street [...] It is tempting to say that these problems are due to the development of technology companies. The truth is that most are chronic problems for decades. As I challenge the tech giants, I also challenge others not to make the tech community their scapegoat. The tech giants want to be part of the solution." Shocked to learn from reading an article in the local press that a student in San Francisco 20 lives on the street, he and his wife have been involved since 2015 in a project to house needy families. He wants his skyscraper to become a "symbol of hope" for all homeless people who sometimes camp not far away, in miserable conditions. That day, the billionaire dreamed of projects as big as his turn. The philanthropic actions appear in the company's statutes according to a model 1/1/1 created by Mr. Benioff since the creation .. Mr. Dayon explains what are these three areas that impact the entire company and contribute largely to the culture of this one. For example, all employees must devote a minimum of 6 working days per year for non-profit-making purposes. This is a reason why Salesforce has become this year's "best place to work" in many countries. Provide the ability to easily and easily create native iOS apps that integrate Salesforce data with the Swift-optimized Salesforce Mobile Software Developer Kit (SDK). 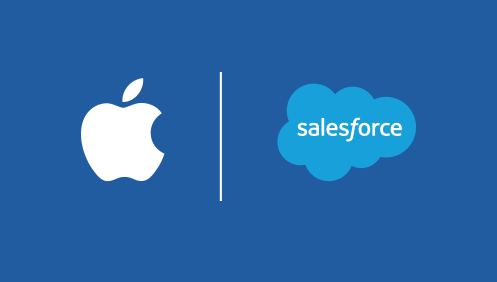 Enhance the Salesforce mobile app with the latest innovations from iOS such as Siri Shortcuts, Face ID or Business Chat. The Get App with iOS App development track is available today on Trailhead. The Salesforce mobile app will be available early in 2019. Einstein is an Artificial Intelligence dedicated to commercial "CRM" solutions for companies. This AI was created in 2016 on the basis of software technologies of machine learning, deep learning, predictive analysis and natural language processing. The digital assistant would become more "intelligent" by multiplying interactions with users and could now process several billion transactions in a day. In the future "couple" Siri-Einstein, it is the voice assistant of Apple who will take care of voice recognition, but the processing of the request itself will be the sole responsibility of Einstein. With Einstein Voice, any user can talk to Salesforce and gain productivity, for example by quickly integrating data into CRM. Einstein Voice Assistant is able to interact with Salesforce to update information, create tasks, record events, or help organize their days. In addition, with Einstein Voice Bots, administrators can also create their personalized customer relationship chatbot, connected to Salesforce and designed to reflect their business. 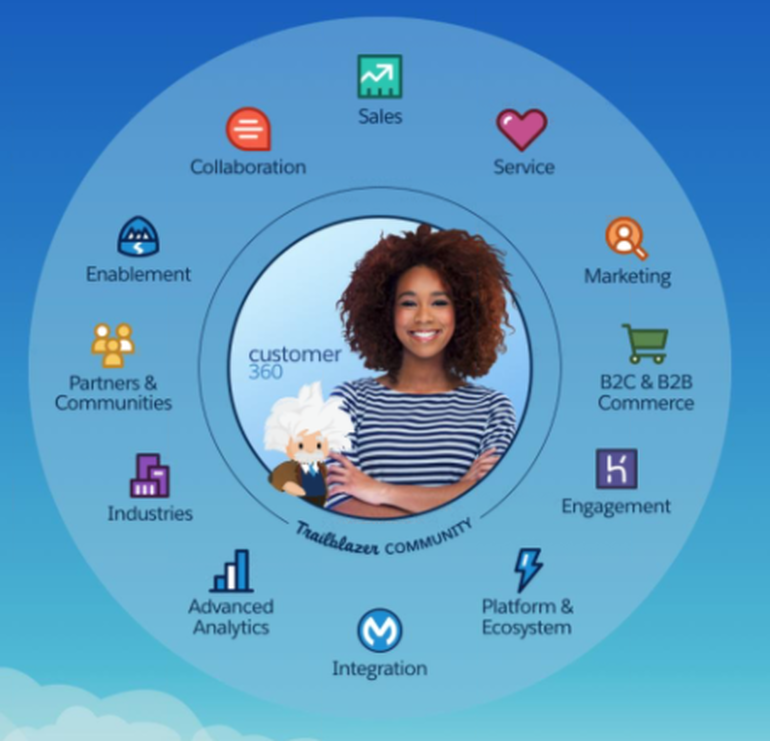 The Customer 360 offering is a new way to connect Salesforce apps to deliver a unified cross-channel experience for B2C customers. With the Customer 360 offering, Salesforce is introducing a new way to connect its applications to deliver a unified cross-channel experience to B2C customers by leveraging B2B solutions. The new Customer 360 administrator interface facilitates customer data management by aggregating customer data from the Marketing Cloud, Commerce Cloud, and Service Cloud into one customer-specific identifier. With this aggregated data hub, businesses always have comprehensive, up-to-date and contextualized customer information, and can build their strategy with a holistic view of the situation. Businesses use an average of more than thousand different applications but less than 1/3 are now connected together. However, the existence of an application network connecting all the data of the company allows real gains in efficiency. 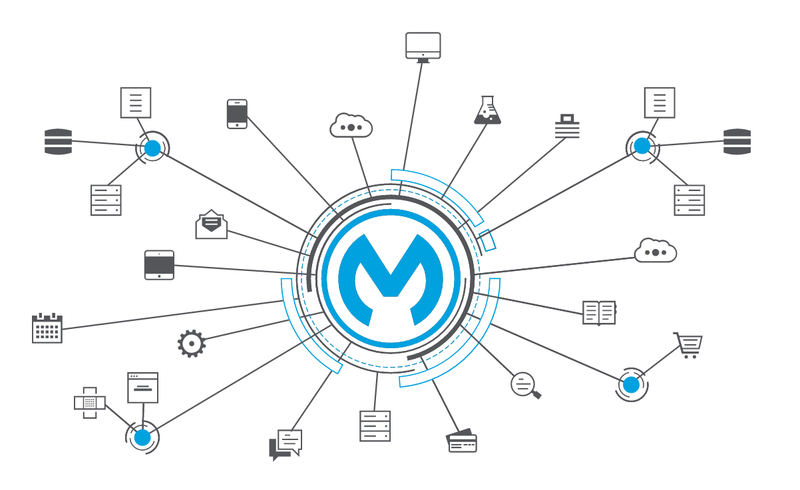 Mulesoft's Anypoint Hybrid Integration Platform enables organizations to build a network that uses APIs to link applications, data and devices to each other. And thanks to the Anypoint platform and its API-based connectors, you can add third-party systems to Customer 360 with just a few clicks like your ERP, customer loyalty applications, and even your connected objects. The new version of Anypoint includes Machine Learning to provide recommendations from mapped data, automation of API visualization and integrations, and new business rules to increase data security. A new version of Quip has emerged! Smoother navigation, connection to Salesforce, Box and Dropbox, but also new function Quip Slides are on the menu. 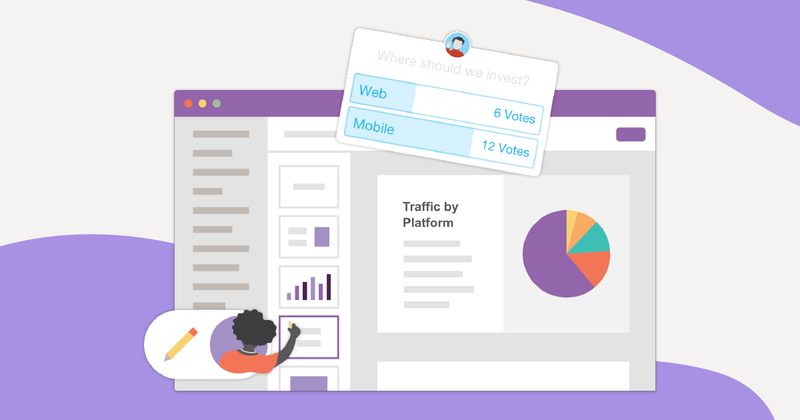 Quip Slides is designed to help businesses create interactive presentations that encourage dialogue and decision-making. Data and charts are updated at the same time as data in Salesforce. With Dropbox Live App, teams can integrate a Dropbox file directly into Quip. In addition, with Box Files Viewer Live App, it becomes possible to access Box documents directly from the Quip presentation for more flexibility and faster collaboration. The hard rock band Metallica was not only present at Dreamforce to perform in concert, but throws a look interested as a Marketing Cloud client he uses to interact with his fans. In its 37-year career, the band has sold 120 million albums and crosses the generations. Today the group's social accounts are followed by 60 million fans worldwide. As the band prepares for a new world tour (the WorldWired Tour is already on US roads), Metallica relies on the Salesforce Marketing Cloud to engage fans on this new episode of the Metallica saga. As a natural addition to this approach, Metallica has added the Commerce Cloud, which brings online commerce functions to offer merchandising merchandise on behalf of the group. Fans can buy items online, buy tickets for group concerts. 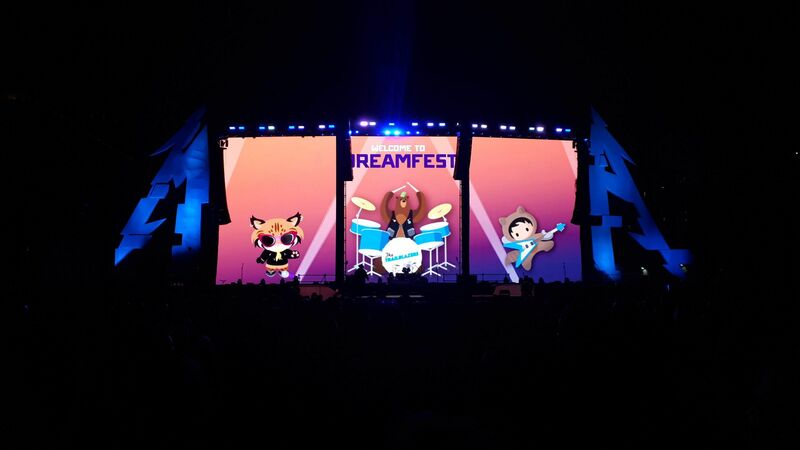 A Metallica 2.0 returned to the stage and has performed live for Dreamforce participants. Their concert were preceded by a Janet Jackson recital. Out of business, the concert presented by Metallica did not miss out on panache: a positive energy among the Trailblazers and these "grandpa on stage" who feasted us! A fireworks came to close this evening, in the middle of the Civic Center, whoa uh! Dreamforce 2018 was also a more sustainable and responsible edition as more than 37 million liters of water could be saved this year by limiting water-intensive products such as beef or single-use plastic bottles. Carbon emissions on site or caused by the arrival of Salesforce employees have also been fully offset. Finally, do not forget to mention and greet the 600 hands (very) active in the various workshops! 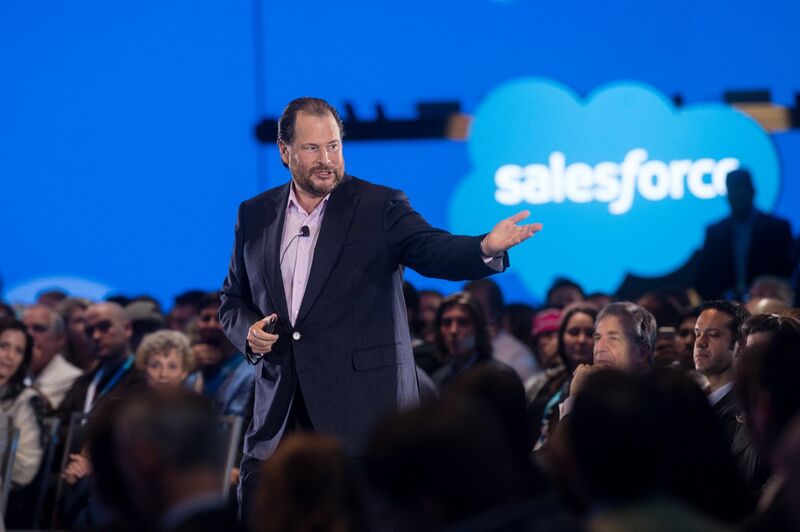 To your calendars for next year: Dreamforce '19 will take place from November 19th to 22nd. Guess where? in San Francisco for sure!